← Armageddon…One World Order … Chrislam didn’t embed as the pope wanted so now its to the theologic government of sharia islam. Congresswoman Ilhan Omar (D-MN) has made a name for herself by making anti-Israel and anti-Semitic comments on a regular basis. 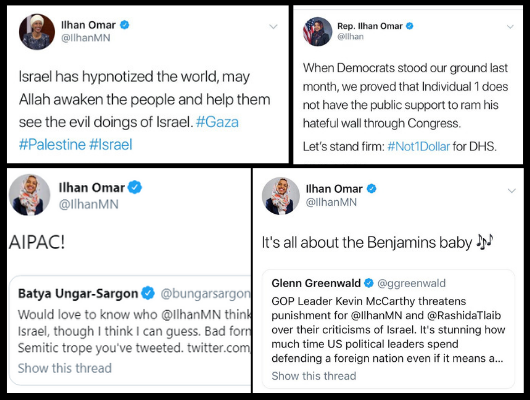 In the last two weeks alone, Rep. Omar has called for the defunding of DHS, and insinuated that Congress is being bribed by Jewish people to support Israel. She is unfit to serve! The Democratic House Leadership condemned her words on Monday, and since then Rep. Omar issued a hollow apology via Twitter that President Trump described as “lame” and insincere. This is an unacceptable response! A slap on the wrist and a fake apology are not adequate responses to the despicable actions of Congresswoman Omar. As a member of the Foreign Affairs Committee, Rep. Omar is privy to classified information, including information related to our relationship with the State of Israel. In order for our national security interests to be protected, Speaker Pelosi and the Democratic Leadership MUST remove Ilhan Omar from the House Foreign Affairs Committee. Click on the button below to sign our Open Letter to Congress DEMANDING Rep. Omar is removed from the House Foreign Affairs Committee. It’s going to take immense pressure and commitment to have Rep. Omar removed from the Foreign Affairs Committee, but together we can get the job done. P.S. – For every $5 donated to ACT for America within the next 48 hours we can mobilize 5 patriotic Americans to take action in support of Omar’s removal from the House Foreign Affairs Committee. Click here to support our efforts!